The Dutch Weed Burger at your event? A House of Seaweed lunch for all of your colleagues? We would love to cater your (work) lunch, social event and dinner on location. Not only at restaurants and festivals you can enjoy some Dutch Weed Burger goodness: we’re happy to come to you and cater your event, (business) lunch, party, drinks or dinner on location! Depending on where and when your company is, we’ll come by cargo bike, our mobile kitchen or food truck. 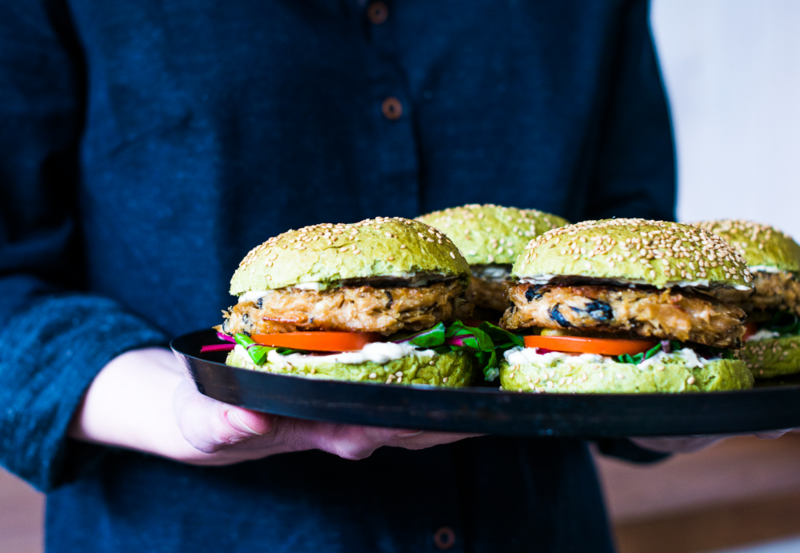 We serve next-level vegan fast food. Through this street food concept, everyone can easily access the plant-based kitchen in a very tasty way. We do not just cook for vegans and vegetarians: anyone who loves good food can enjoy our menu! You can pick whatever you like from our entire menu. And you can of course decide to just let us serve half portions to everyone. Whatever you like! Everything is totally plant-based and enriched with seaweed and micro-algae from our sustainable seaweedfarm Zeewaar. You may choose to go with our classic Dutch Weed Burger or his brother fromanother mother the Banzai Burger with an Asian twist: served with paksoi, Thai basil, red and spring onions and a miso-ginger-lemon dressing. Or maybe you’re in the mood for the Wish ‘n Chips: gold green, salty and crunchy Sea Nuggets, whether or not served with crispy potato fries, caramelised lime slices and Weed Sauce with capers. Or go for the Seawharma: a thick traditional flatbread filled with grilled seitan that’s flavoured with Dutch seaweed and Arabic spices, a lot of nice veggie toppings, tahin and our Garlic Weed Sauce. Or you might want to choose the Dutch Weed Dog: a true vegan pitbull, also made of grilled seitan, enriched with Royal Kombu flakes and chipotle. Served with killer toppings like red sauerkraut, pickles, fried onions and topped off with a Spicy BBQ sauce and an unbeatable homemade Green Algae Mustard. So it should be clear: there’s lots to choose from! Would you like to discuss all the options? Or maybe book us straight away? Give us a call at +31 (0)6 24 85 76 39. Or leave your question or cater request down below. We’ll get back to you as soon as possible!